Discussion in 'Reviews and Articles' started by tweakmonkey, Jul 11, 2008. The biggest speed bump while browsing the web with an EeePC 700, (or 701, 900, 901, MSI Wind, etc.) is its horizontal and vertical resolution. Wide web sites require you to scroll side-to-side, and most web sites require excessive pagedown presses or a heck of a lot of scrolling vertically. Forums can be particularly painful if they are too wide, and some web sites are simply unusable. A few tricks go a long way, so give these a try before you throw in the towel. At the time I wrote this, only one popular web browser offered a “Fit to Width” option and full compatibility with the sites I read. This browser was Opera, which also happens to be very lightweight and fast: perfect for a small and slow notebook like the EeePC. It also features “Speed Dial”, a nice feature for minimizing clicks and time wasted. I would not consider any other browser for primary browsing on an ultra portable, as Opera is generally perfect – but you may find Firefox works better for some sites, so keep it around. To install Opera, simply download the application from the web site and run the setup executable. I have not installed the browser on Xandros (the packaged EeePC 700 OS) but I will update when I get a chance to do this later in the week. 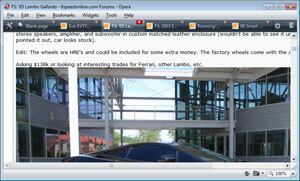 To see how the “Fit to Width” option works, open a site that is too wide on your small screen. This one, even. At the top tabs, choose View, then Fit to Width. Voila! All text, tables, and web sites should magically fit to the width of the browser. No more side scrolling is required! Some sites may look a bit funky, but you'll find it's well worth using this option if you browse frequently. 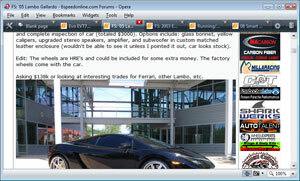 Then hit F10 or choose Full Screen and you'll hide everything except the contents of the browser. 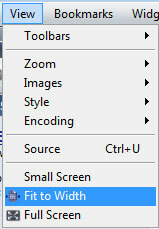 An article here explains how to set the “Fit to Width” feature as a hotkey for all tabs open at the same time. For now you can simply click the option when sites are too big. There's also the “Small Screen” option, but this reduces the resolution to one ideal for a phone or PDA. It will be just be too narrow for most screens. Regardless of which browser you use, it may be beneficial to turn off the extra toolbars that are not necessary to maximize the vertical space you have. In Opera, click View, Toolbars, and turn off the Status Bar and Address Bar (you can always double click next to a tab to open a new tab by Google Search or Speed Dial). This is unnecessary if you browse in Full Screen mode (recommended). If running Windows XP, the bottom task bar (Start button and running programs) takes 30 pixels, which is a significant chunk when you've only got 480 vertical pixels. Right click the bar, and choose Properties. Then check the box “Auto-hide the Task Bar”. One reason I always liked Linux was for its desktop workspace managers, that allowed you to effectively manage smaller screens by switching completely the windows you had open all at once. Luckily for Windows users, there's a free, easy-to-install application that adds a workspace manager to your desktop. It's called VirtuaWin, and allows you to press hotkeys to quickly change between the spaces. I found it to be very useful, particularly on the EeePC, and especially for programming or web administration. Don't skip this application: give it a try right now! If you're reading a long page, scrolling becomes a chore. There are ways to make scrolling better (see below), but the best solution for eBooks or long PDF documents is often to simply rotate your screen. You can do this on the EeePC if you install the included Windows disc for its drivers and applications. Hit Ctrl-Alt-Left, Ctrl-Alt-Right etc, to change the orientation of the screen. Hold the EeePC like a novel and enjoy the reading. Since you will be scrolling quite often if you're using a low resolution screen for browsing, you will want to make a few adjustments. First, learn the hotkeys for Page-Up / Page-Down. On my 700, I believe it was FN-Left or FN-Right. With most applications, the Spacebar also pages down. Next, turn up the scroll rate of the touchpad's side/scrolling area (if you move your finger up or down on the right side of the touchpad, it will scroll downward). In Windows, you can do this by choosing Start, Settings or Control Panel, Mouse. Increase the number of lines to scroll at a time under the Wheel tab. Since the touchpad is small on ultra portables, you may want to turn up the rate as well. Nothing really beats an external mouse, but clearly that defeats some of the purpose to using your ultra-portable in the first place. If you know you'll be browsing for long periods of time, you should still consider packing one along. There are many other tweaks for the EeePC and Ultra Portables out there, but this list will help you make the most of the low resolution for now, which should lift a huge burden from your shoulders. Enjoy! Does virtuawin allow saving or only showing files/folders on the desktop for each desktop? Meaning can I have folder "A" only show up on desktop 1 and have folder "B" only show up on desktop 2?